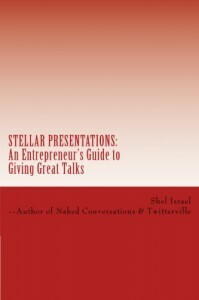 In this guest post, Shel Israel introduces his new book, 'Stellar Presentations: An Entrepreneur’s Guide to Giving Great Talks' [February 2012]. 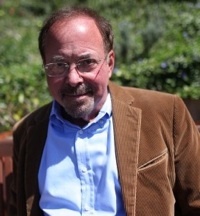 Israel is a contributing columnist at Forbes.com and has contributed previously to OpenForum, BusinessWeek and FastCompany. His blog, GlobalNeighbourhoods.net is often listed among the world’s top business blogs. He has been a keynote speaker more than 50 times, addressing audiences on five continents and in 14 countries. 'Stellar Presentations' is his fourth book. I am a recovering publicist. I owned my own Silicon Valley PR agency for 17 years. We specialized in helping startups with their initial launches and my personal energy was invested in helping entrepreneurs tell their company or product story for the first time. Since selling my agency, I’ve continued to coach executives in effectively presenting to the media, to investors and particularly at conferences. Additionally, I’ve also been the editorial critic. For four years I was editor of Conferenza Premium Reports, a subscription-based email newsletter that reviewed the most prominent tech sector conferences. I watched and reviewed hundreds of presentations by influencers, luminaries and companies representatives. I’ve written about social media for several top-tier business publications and am currently a columnist for Forbes. I also wrote two hardcover books about social media, Naked Conversations and Twitterville. These were well received and I started getting invitations to speak about social media at events all over the world. The experience changed my perception of public speaking immensely. It was harder to do than I had thought. Last November, I spoke at Nasscom, India’s largest entrepreneurial conference. The producers asked me to talk about how to give a great presentation. The very favorable response I received taught me that entrepreneurs are hungry for understanding the dynamics of presentations and that they needed useful tips on how to do it right. My Nasscom Powerpoint slides became the original outline for my new book, Stellar Presentations. When the good folk at Slideshare invited me to select any chapter in the book for this guest post, it took about ten seconds to decide. If you are reading this you care about presentations and this very brief chapter looks at one of the key issues you will, or should, ponder before presenting. There are many ways to structure your presentation, but the two most common approaches center either on PowerPoint or storytelling. I heavily favor storytelling. Something there is that does not love a PowerPoint-dominated presentation. Conversely, we all seem to enjoy a good story. PowerPoint can be tedious. Some presenters pack slides with data, graphs and text, which are often hard to read. Some speakers actually turn their backsides toward the audience, to read aloud from their slides. I don’t advise it. Because PowerPoint presentations can be so tiresome, a few conferences have banned their use. Conversely, other venues—particularly those geared to venture capitalists and angel investors require it. I have to admit that I am a little schizophrenic about PowerPoint myself. It was among the first products SIPR launched, when we helped the developers introduce it back in 1987. When I speak, I sometimes share that fact with audiences. Then I beg their forgiveness. It always gets a laugh. Despite its flaws and frequent abuses, PowerPoint can add significant value to a talk when it is not misused. Many of the most stellar talks I’ve seen have incorporated PowerPoint or some other slide software. I always use Powerpoint in my presentations. One of my dirty little secrets is that without it, I am likely to lose my place while speaking. But there’s another reason to include it. PowerPoint can be a great supplement to your talk. I use it to illustrate the stories I tell in the same way photos enhance the articles and blogs I publish. I’m a minimalist on text. If I use bullet points, there are usually only one-to-five words per bullet and the font is large enough to read from the back of the room. When I click to a new slide, I pause and let people view it for a moment. When their eyes return to me, I start talking and I move in front of my slide so that I don’t get upstaged by it. The core of nearly all my presentations is telling stories that illustrate business points. It has been my experience that story-based presentations are infinitely more memorable than PowerPoint-centric talks. Stories are part of our human DNA. Our culture, religion and national history are based on stories, not bullet points. There are stories with us today that were first told in five minutes time 5,000 years ago. By contrast, I have seen quite a few PowerPoint slides that felt like it took 5,000 years to present and were remembered for less than five minutes. I bet when you get together to enjoy a meal or perhaps just an adult beverage with your friends, you share a few good stories. But, have you ever shared a good PowerPoint slide over a beer with a pal? I didn’t think so.